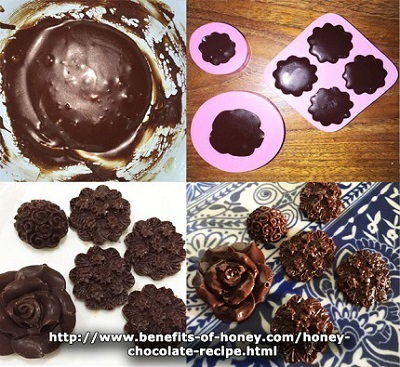 If you love chocolates but are avoiding them because of the corn syrup and processed sugars in them, here is a healthier option to satisfy your sweet tooth or fight that sugar cravings - honey chocolate recipe. 1. Gently melt the cocoa butter in a double boiler or a glass bowl on top of a small pan containing some water. 2. Add the honey and whisk with a fork. 3. Stir in the cocoa powder and blend until mixture is smooth. 4. Pour the mixture into a chocolate mold or a glass pan. 1. Leave the chocolates in the freezer to harden so that they stay longer as a solid when taken out of the refrigerator. 2. For a healthier chocolate version, coconut oil can be used in place of the cocoa butter. But the chocolate will not be as thick and creamy as most people like it to be. 3. If you like a more exciting, flavorsome honey chocolate, you can add some chopped dried fruits, such as apricot or crushed nuts, such as almond, or even use your most favorite distinct floral varietal of honey. End of "Honey Chocolate Recipe" . Back to "Delicious Honey Recipes"